Mallory Fenske (14) dribbles past a Denver defender Thursday night. 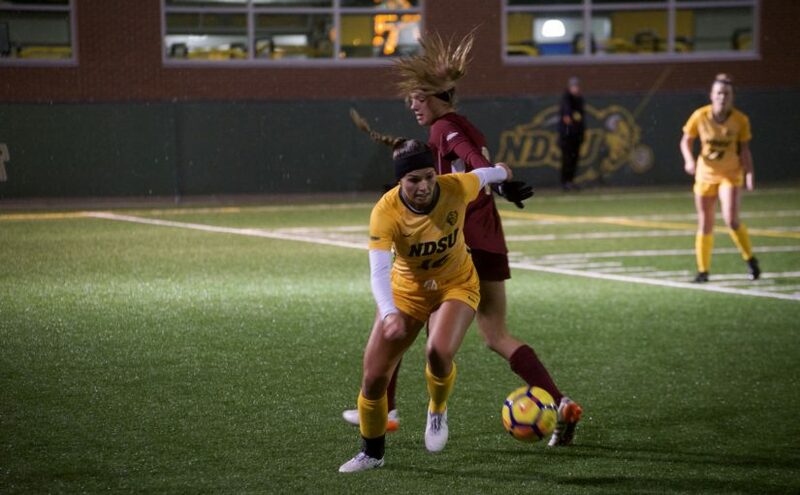 Both the North Dakota State Bison and the Denver Pioneers opened their Summit League campaigns with a pair of victories. But last Thursday night, they both faced the question if they could win on a cold, rainy night in Fargo. With a constant drizzle and temperatures hovering in the low 40s, Denver came out with all three points, coming back from down 2-0 to win in overtime 3-2. With the conditions not ideal, the first quarter of an hour was a feeling out period. Given the conditions, goals were likely to come from two sources: on a set piece or off a mistake. The latter by Denver opened up the game. Bison midfielder Roxy Roemer swiped the ball from the Denver midfield. The senior slid it to her classmate Holly Enderle, whose low shot was blocked by the retreating Pioneer defense, allowing goalkeeper Brittany Wilson to collect. At the other end, Monica Polgar was called into similarly non-essential action. The junior calmly claimed a quick shot from Denver’s Meg Halvorson. Roemer and Enderle came even closer after 25 minutes. In a move similar to the one earlier, Enderle forced Wilson to get down to her left and palm the low shot away. The Bison threatened as the half-hour mark came down. The preamble came as Roemer drew a foul 35 yards out. Mallory Fenske’s lofted ball in found the foot of Malley O’Brien. The shot forced a fine reaction save from Wilson, and the Pioneers scrambled the ball away. Roemer’s in-swinging corner was put into the mixer and turned in by Enderle to give the Bison a 1-0 lead. The Pioneers were gifted a golden opportunity to level the game 10 minutes later. A foul by Roemer gave Denver a free kick from 21 yards out. Natalie Beckman called a leaping Polgar into action and forced a save. Enderle had her brace two minutes from halftime. Played into acres of space down the Bison right flank, Fenske had plenty of time to cross. The cross found Enderle’s head, and the back of the net beckoned. For the forward, it was the fourth goal of the season, and NDSU went into the break ahead 2-0. As the rain changed into a wintery mix, Denver forced the issue in the second half. The Pioneers controlled possession out of halftime, and the Bison sat back to defend. But the first warning shot came on the break by the Bison. Roemer hit a big diagonal pass into the path of Mariah Haberle to send the outside midfielder through. Two Pioneers slowed Haberle in the box, but the junior cut back and looked to the top corner near post. Wilson leaped to push away the shot, and Denver survived. Denver continued to control play as the clock pushed past the hour mark, and the Pioneers finally broke through. Halvorson found space on the Bison left, and Samantha Feller put away the cross. NDSU continued to sit back and defend. 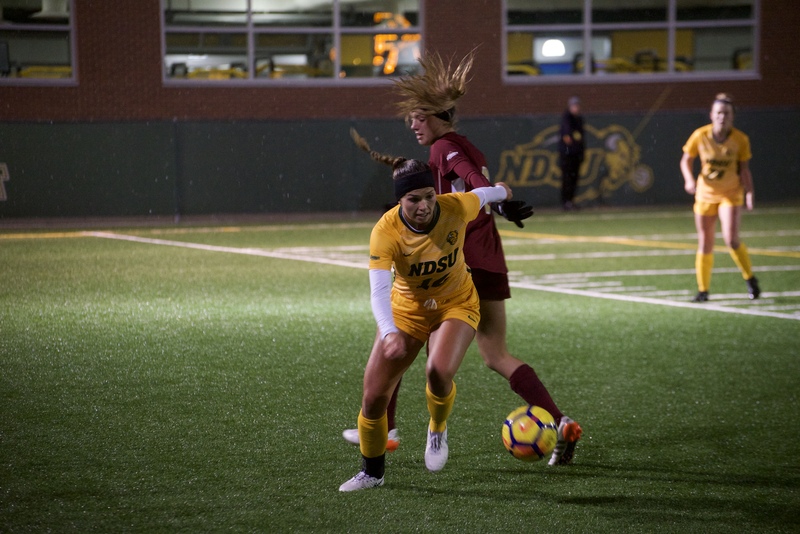 The Bison backline stood tall as the clock wound down inside of five minutes to play with a chance to climb to the top of the Summit League table. Beckman once again forced a touch over the ball from Polgar in the 89th minute, and the Pioneers sent 10 players forward for the resulting corner kick. With 31 seconds to play, the cross swung in, and Camryn MacMillen, in the crowd of bodies, turned the ball in. At the death, Denver forced overtime. The extra period continued much like the second half with the Pioneers on the front foot. Beckman was once again the instigator in the early going. As half-hearted penalty appeals sprung out as she was brought down in the box, the Pioneer midfielder sprung back to her feet and forced Polgar in to another touch over the bar. It wasn’t too much longer for Denver to claim all three points. A fine little passing move in the attacking third led to the ball at the feet of Hannah Adler. The junior slotted home to complete the smash and grab job by the visitors. NDSU dropped to 5-5 (2-1 Summit League) and continue a difficult stretch of the schedule with a trip up I-29 to take on North Dakota Sunday. The Bison return to Dacotah Field at 1 p.m. Sunday, Oct. 14 to host South Dakota State.